AHC Products create a natural seal of the sweat gland orifices in the intermediate and lower layers of skin. The effect appears after the first applications and reduces the secretion of perspiration by 80 to 100%. The sense of well being is not impaired by the treatment since the body still has a sufficient number of evaporation surfaces besides the treated zones. The products, which are exclusively for external use, are highly protective of the skin because of their enrichment with plant extracts. In most cases one application per week is enough. 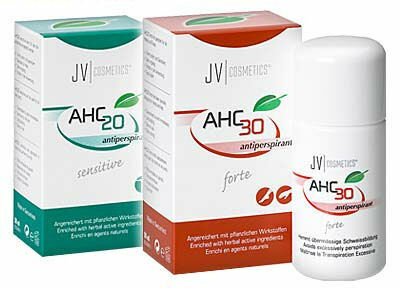 The company, JV Cosmetics of Switzerland, was established in 1998 with the goal of producing products to counteract excessive perspiration using high-quality ingredients. The striving for higher product efficiency and an acute awareness of costs are parts of the company’s philosophy: to be able to offer our customers an optimal ratio of price to performance. JV Cosmetics achieves this by a modern, ISO 9001:2000-certifiierd Process management system; by which all processes [assuring] the optimal development and production of the products desired by our customers are regulated.